I am happy to announce the birth of Hannah Ruth Baker on November 29, 2012. 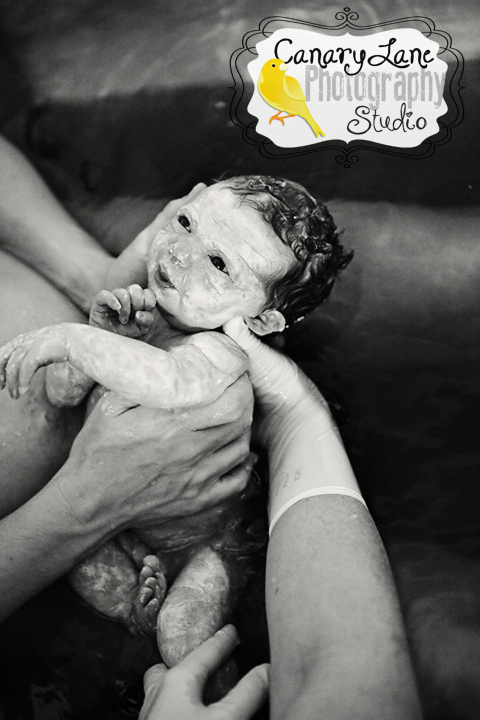 Hannah’s was my first rainbow birth as a doula. Hannah was born into water at home and into her mom’s hands at 9PM the day before the one year birthday anniversary of her twin brothers, Henry and Elijah, who were still born, born to heaven on November 30, 2011. I thought, as did Mama Robin, that Hannah would come in December. I joked that she should come on my birthday 12/3 or on the much notorious 12/12/12! The morning of 11/29 we all thought Robin was having warm up practice contractions. It was throwing things off balance, very disconcerting to think that Hannah could possibly come so close to her brothers birthday, maybe even on their birthday. What was God doing, I asked myself. And I prayed. 9:07AM text from Robin: Stronger, not closer. Backache and feel like need to pee with them. I got kind of jumpy since Robin has such quick births. I can testify to that since I’ve been Robin’s doula four other times. I wanted to go up to Temecula and be with Robin. But she reassured me that they were plenty spaced out and didn’t want me to come up for these “multip braxtons”* as she called them. Robin even timed a few for me. They were still 15 minutes apart. In a few hours it became clear that Hannah and God had picked this day for her special birthday. I passed the afternoon in my office while Robin stayed busy preparing and delivering a new mommy’s encapsulated placenta. Robin and her mom, Ruth, were also sewing up a storm. They finished little Hannah’s coral and turquoise curtains and dust ruffle, then at 2PM Robin and her mom did Robin’s belly cast! Robin shared something really special – in a text of course. 1:05PM text from Robin: Last cntrx could feel cervix opening. Feels like pulling cramp inside. So cool! Robin: Lmao. We are so weird! Rosie: Love the play-by-play : ) What’s for dinner tonight? How far apart now? Question:Who could be texting about mucous, bloody show and dinner in one sentence? By 5PM Robin couldn’t type or her text didn’t make much sense so I knew it was time to head over. I was on the I-15 headed north when Robin’s text to me read, “That one hurt, lasted 1.5 minutes” Next text was that the hot pack felt really good on her back. That’s when I realized that she was in her doula head. And she is a great doula! So now what could I, her doula, do for her? What could I do for Robin when she knew comfort measures, what works, what doesn’t, all so well? I would hold the space for her. I would love her three excited little boys! Heck, even if I did nothing Robin would know that my love for her was present. I could pray. I could always pray. I prayed all the way up to Temecula! When I walked into the house Grandma Ruth had the three boys lined up in front of her. She was having a serious talk with them. Something about mama having the baby and if grandma asked them to do something she would need cooperation. “What is cooperation?” asked Owen. I went to find Robin. First I found Michael in the kitchen on the laptop finishing up some work. After chatting with Michael a bit Robin sauntered down the stairs. “Rosie were you trying to miss this birth? I’m 8 centimeters!” She was in the cutest bikini and looked like a model, not at all in labor land. Robin did some contractions there in the kitchen, leaning on the counter, while giving some last minute directions to her team. I was familiar with Robin’s busy efficient labor routine. I told the midwife, Caydee, “She’ll fold clothes and stay busy until she gets in the water, then the baby will come out.” I may have been thrown off by her nonchalant seemingly comfortable labor if I didn’t know Robin so well. When Robin did go upstairs to get into the tub everything slowed way down. The energy was shifting. Michael was reading night time stories to the boys and singing to them like he does every night. His singing to his children always makes me cry. Soon the boys came to kiss Robin goodnight while she labored in the warm tub. The boys were all chatty about who wanted to be woken up for the birth. After the boys were tucked in Robin and Mike spent alone time while we (Andrea, Caydee, Victoria, Ruth, Erika and I) made ourselves sparse downstairs. Andrea Meyer was the senior midwife, the backup for Michelle Freund. Michelle was out of town. Caydee was Michelle’s assistant who has a relationship with Robin so she acted as the main midwife that night. Victoria was the photographer and then there was just Ruth, Robin’s mom, Erika, Robin’s sister, and me, the doula. Soon Robin was sounding more active and we joined them in the bathroom. Robin has one of those big, very roomy bathrooms with a large deep tub. Mike seemed pretty cool for being watched by six women encircled around he and his bride. He was focused on Robin, they were cheek to cheek. Our total focus and attention was on Robin too. The music was lovely. The stage was set. It was 8:30PM. 7-18-13 Today I will try to finish this birth story. 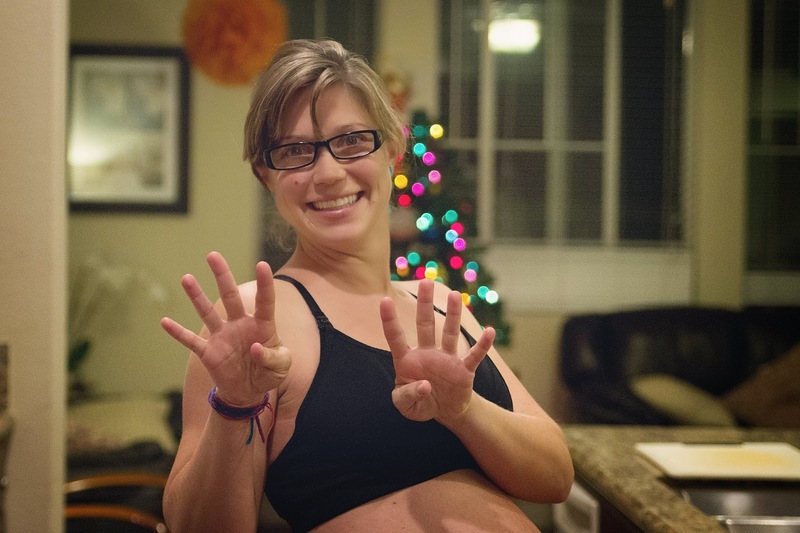 As I read my words above I wondered why I had not finished Hannah’s birth story. I believe that I got emotional and it was too hard. It was at this point in Robin’s labor that she cried and Mike wiped her tears. It’s not unusual for a woman to cry at this point in labor. But Robin’s tears were for her twin boys. The last time she’d been pushing she was pushing out Henry and Elijah. And it broke my heart to remember that day. I held those precious boys and grieved with Robin and Mike. The music played away in the background. All I could think of is that while honoring the twins we could, we would. choose. to. honor. this. new. life. We would be grateful, be present. I prayed for words to share with Robin. To make it okay. But she was more whole, more knowing, more strong than I could know. Our Father God was with her. Robin took her time experiencing her grief as long as she could while not delaying Hannah’s moment to shine. And shine she did! 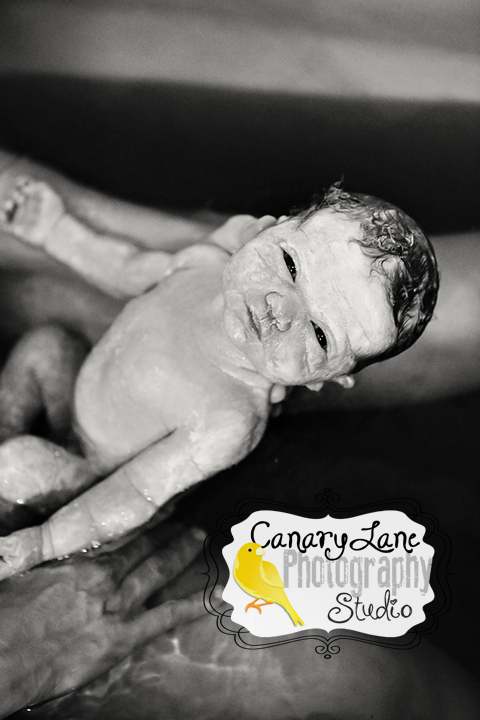 In the steamy bathroom Hannah slipped into the world, into the tub filled with warm water, into Robin’s hands. Into a room filled with witnesses that were changed forever. It was 9PM. Time stood still as it does when we take the time to notice natures miracles. To me time stands still at each sunset and sunrise…and at each birth. Birth commands our attention. Everyone reading this may also want to take a moment. Take a deep breath. It’s called The Birth Pause. Moments like Hannah’s birth deserve a moment, a prayer. Mommies and babies need to catch their breath, both literally and figuratively, after the journey of birth. Soon enough time moves on. It seems like I ran around the rest of the night in a fog, trying to be helpful and not be in the way. I made Robin’s herbal bath and fixed up some light snack for her that she never ate. 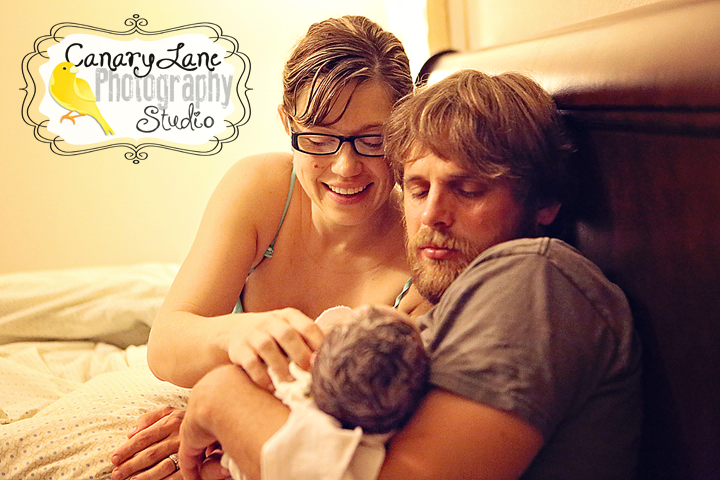 She was enraptured by her beautiful, perfect, chubby, pink baby GIRL! Of course we knew Hannah was a girl but we weren’t prepared for the full reality of her. It’s like you know when your pregnant you are having a baby but meeting baby face to face is always such a shock, a delight, a miracle!!! Michael got out his guitar and sang to Hannah. Then Robin and Mike slipped into their bed and took turns holding their daughter. Caydee did the newborn exam. Hannah weighed 7lbs1oz. Then Robin and Hannah went back into a fresh tub of warm water, a herbal bath that was good medicine for healing Robin’s perineum. It is 1AM and I am the last one to slip into the night and leave the new family to nurse and sleep. Guess which one Mike did and which one Robin did. Here is Hannah’s birth featured on Birth Without Fear website. Now that Hannah’s first birthday is fast approaching I am thinking more and more about Hannah, her mommy-my friend, and the gift of knowing them, the blessing of being their Doula. Life can be bumpy, but when I consider the blessing poured out and received into my heart each time I am honored to attend birth I am speechless. Not quite actually, as you can see here I am not speechless. But finding words is challenging. In all honesty I am often ashamed of any weak moment that I might forget my fortune and whine or complain about the bumps. Welcoming sweet wet brilliant babies earthside is as close to heaven as I can imagine. I thank God for calling me to birth work. Dear Rosie, I don't see why I should be surprised or “newly impressed” if you will by this beautiful story… but I am. The depth of your compassion and grace are truly inspiring, you are indeed one of the kindest, gentlest, most loving people I've ever known. Jerry Reed sang a song called “Smell the Flowers,” that's the way I'll always picture you. “You wont get this day again 'cause every road has got to end, so don't forget my friend to smell the flowers…” A wonderful tribute to a beautiful family, may God continue to bless all of you.